Geographic books routinely introduce map projections without providing mathematical explanations of projections and few delve into complex mathematical development or cover the breadth of projections. 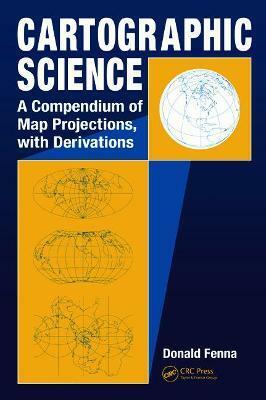 From basic projecting to advanced transformations, Cartographic Science: A Compendium of Map Projections, with Derivations is a comprehensive reference that offers an explanation of the science of cartography. The book is a compilation of more than a hundred map projections, from classic conics to contemporary transformations using complex variables. Starting from widely described geometric projecting onto flat paper, cylinder, and cone and then progressing through several layers of mathematics to reach modern projections, the author maximizes the application of one layer of complex mathematics before continuing on to the next. He also supplies numerous one-page tutorials that review terms and methodologies, helping minimize the challenges of unfamiliar mathematical territory. Divided into four parts, the first section examines the shape and size of the Earth, then proceeds to investigate the means for relating the curved surface to a flat surface, and addresses scaling. It goes on to cover pertinent principles of projection including literal projecting, true but synthetic projections, secantal projections, pseudocylindrical projections, and pseudoconical projections, as well as the other variants of more serious projections. The book concludes by looking at factors influencing Mean Sea Level and notes the cartographic aspects of current developments. Cartographic Science: A Compendium of Map Projections, with Derivations explains the mathematical development for a large range of projections within a framework of the different cartographic methodologies. This carefully paced book covers more projections, with gentle and progressive immersion in the mathematics involved, than any other book of its kind.